Alkenes reacts with peroxycarboxylic acid to give oxacyclopropanes (epoxides). 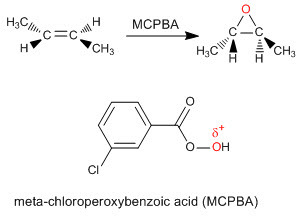 A popular peroxycarboxylic acid is meta-chloroperoxybenzoic acid (MCPBA). These compounds contain an electrophilic oxygen in the OH group and react with alkenes by adding this oxigen to the double bond to form oxacycloprpanes. Mechanism of epoxidation take place across a cyclic transition state. MCPBA gives preferential epoxidation of the more substituted alkene. Vanadium catalyst gives preferential epoxidation of the less substituted alkene.